I have a problem friends. My shop (A.K.A. my half of the two car garage), is a disaster. I desperately need more storage and organization. My husband is a maker too (cars, not wood) and we are just running out of room! 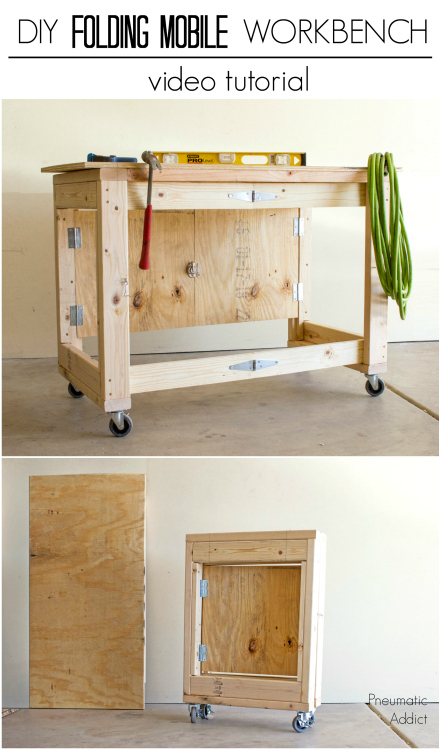 I've been dying for a mobile workbench that I can assemble my furniture on but I had no idea where I would store it. I started brainstorming and decided I could create a folding or collapsible workbench that could be stashed out of the way when not in use. I asked for suggestions on my Instagram stories, and I had some awesome advice! A new friend of mine directed me to the folding table base from an old issue of Popular Woodworking (check it out here). I based my plans on that design but encountered some problems. I made some much needed modifications and I'm really happy with how it turned out. If you follow my YouTube channel, you'll see I just dropped a new video detailing the whole build. I got to try a couple new tools on this build. 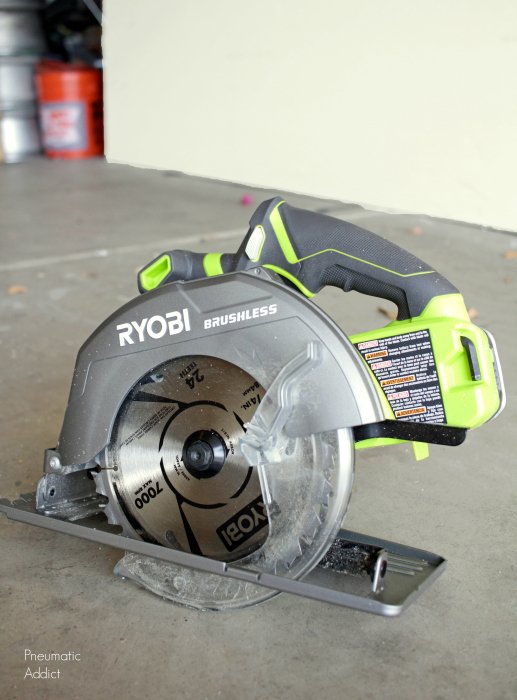 Lately, I've been using my new Brushless, 18V circular saw from Ryobi and it rocks! Being right handed, I'm much more comfortable with a saw where the blade is on the left side. 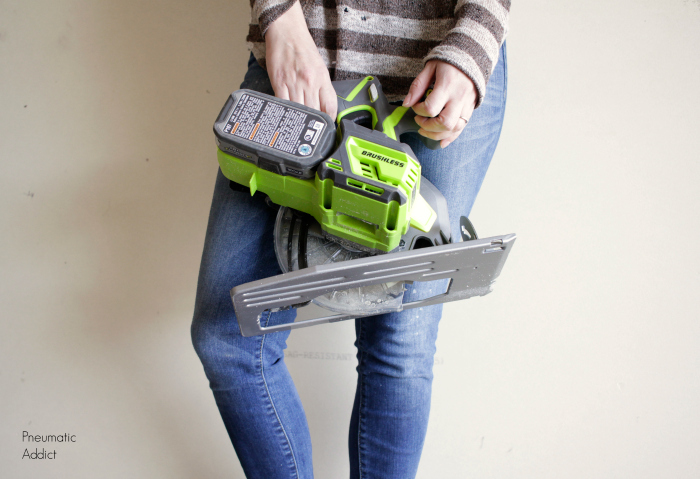 Unfortunately, they seem to be hard to find in a cordless saw. That's why it's my new go-to. 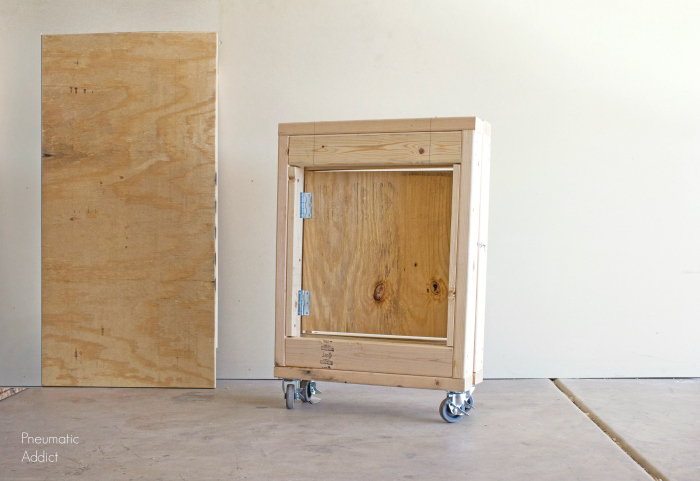 Before you set up your new work space. Make sure to clean up! 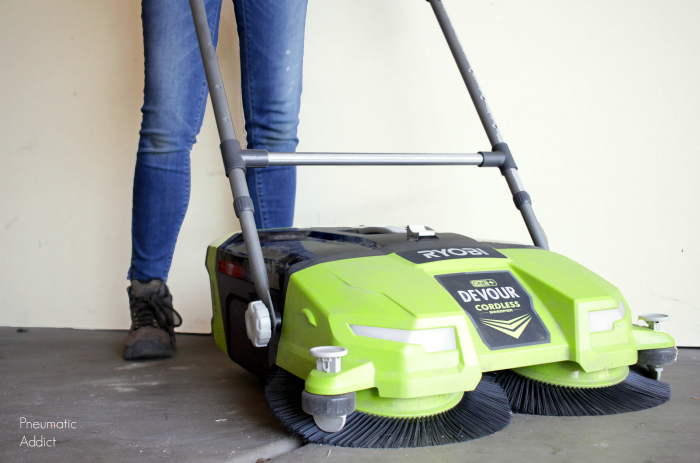 I've been using the Ryobi Devour, a cordless sweeper, and it sure makes post building clean up a much more pleasant task. I can sweep up my entire garage in minutes. It even picks up small off cuts! Optionally, you can add hook an eye latches to the outside faces of each leg to hold the frame together when not in use. The best part of the detachable top is how easily it can be replaced. 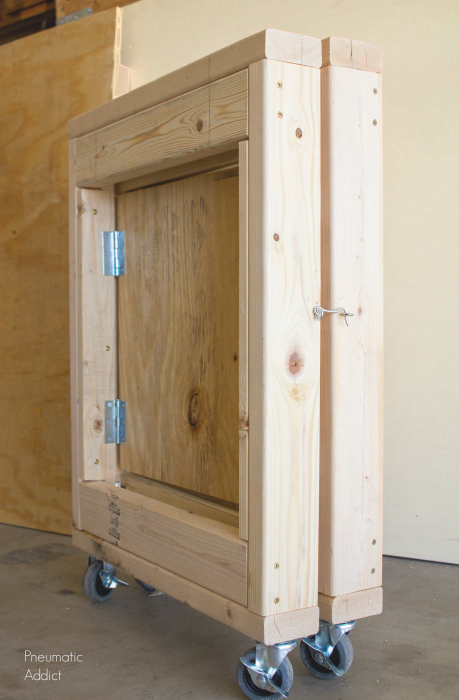 When the plywood gets worn, I can pick up another quarter sheet and drop it on. 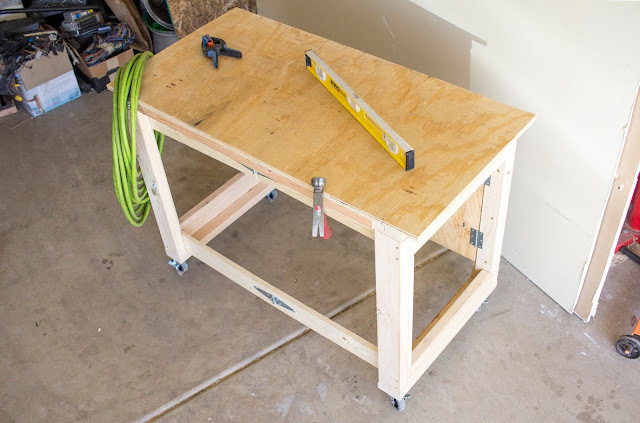 When not in use, the bench folds into an approximately 24" x 34" x 8" rectangle, which can fit into even a small, crowded garage like mine. Hooray for more work space! Like this idea? Pin the image below to save the idea for later. I can't believe no one has had anything to say about this project. I'm relatively new to reading your site and figured out quickly you are highly skilled. I wish I could do half of what you accomplish. 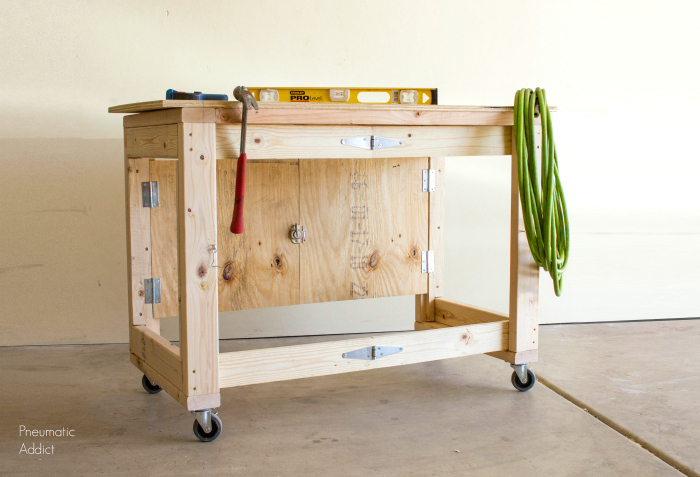 I am keeping this workbench in my list of items I would like to have. It looks great and is a very practical piece. Thanks for taking your time to post these projects with instructions too. Excellent modifications to the original plan. Also an excellent article to go with the video. I'm now a subscriber. Nice work. Planning to change the dimensions a bit, but on my immediate to-do list. Great work bench but the hammer hanging on the edge makes me cringe. Looks like an accident waiting to happen and you in soft shoes! Like this. I'm getting into space saving. This could work for me. Great portable folding work table, I have seen the old version but no cutting and assembly instructions. Could you provide me a detailed instructions? Send it to my email: nipo@ mindspring.com. Many thanks, Nicholas. 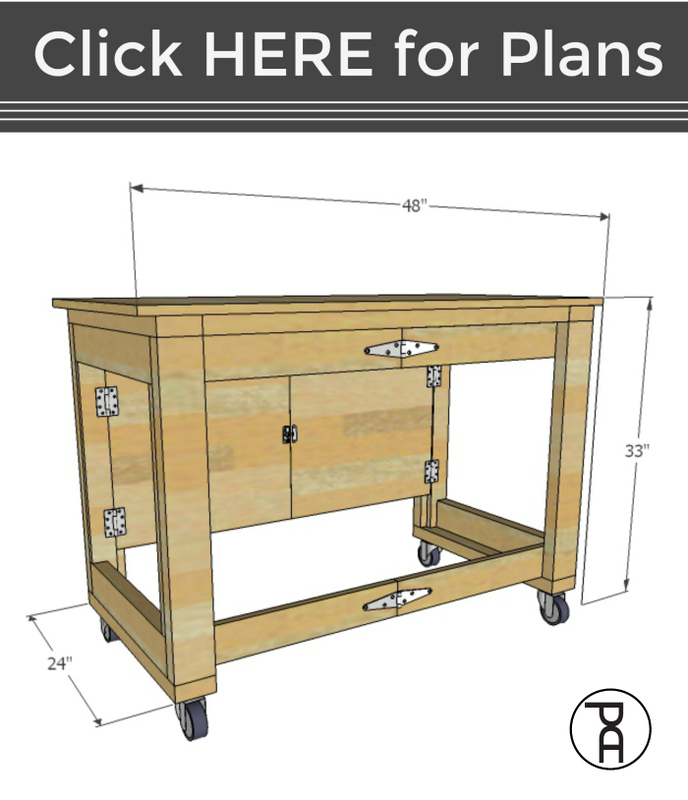 Thank you for sharing the plans for the folding workbench. I made it about 5 weeks ago exactly as your plans stated and I am so happy I made it. It is such a space saver and I've used it on my deck, in my garage and in my drive way. Not to mention just took it to my sisters house to help do some woodwork for her. May be helping her build one soon. What a space saver, and THANK YOU AGAIN for sharing! How much would you say this weighs?? Hi. Can I used regular hinges instead of the strap hinges?